Originally running on Kickstarter during October and November of 2013, Purgatory Pub, Book 1 from Gabriel Dunston is finally available for the public! 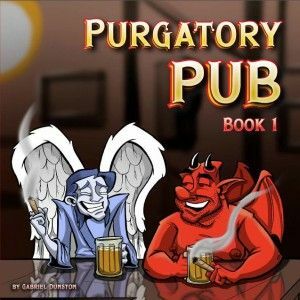 Telling the story of two unlikely friends – an angel and a devil from opposite sides of the afterlife -, Purgatory Pub delves into themes of friendship, brotherhood, betrayal and more as it also focuses on the fallen angel Lucifer and the Archangel Michael. In the afterlife, it seems like most would tend to stick to their side of town and their own side of the religious divide, except for one devil and one angel who have struck up an unlikely friendship. They meet regularly to drink and smoke cigars, hashing out the difficulties of the jobs and even hitting on their unlikely friendship at points. It’s when they start to venture to the other’s respective neighborhoods that they start to see things aren’t always so great. Heaven appears to the devil as a gated community with a security guard, while Hell isn’t nearly the fun that the angel imagined his friend was having. Along the way there’s a look at the Lucifer’s own journey from angel to devil and how Lucifer is something a bit different to each side of the afterlife. Honestly, I initially didn’t expect great things from Purgatory Pub, but was surprised. It’s much more than an angel and devil sitting around and drinking. It delves into some somewhat heavy religious points, themes of friendship and brotherhood and disappointment, and how two seemingly opposite guys can be the best of friends despite it all. Dunston gives the book a light feel, with plenty of comedy and banter between the two leads, but is able to easily make the heavier points hit home. Dunston’s art is black and white, painting Heaven and Hell in various shades of gray. The cartoony style lends well to the sometimes ridiculous nature of the story, and doesn’t take away from the serious moments. My only real gripe is that at times the PDF I was sent was a bit less than clear. It might just be the PDF and not the print book, but it’s worth noting. Purgatory Pub is a surprising look at the afterlife from the perspective of two unlikely friends. At times silly and at others quite contemplative, the book is more than it initially seems. Digital copies can be purchased on Gumroad for just $5, while print copies are available on Amazon. Definitely worth a look for those interested in a something a little different.